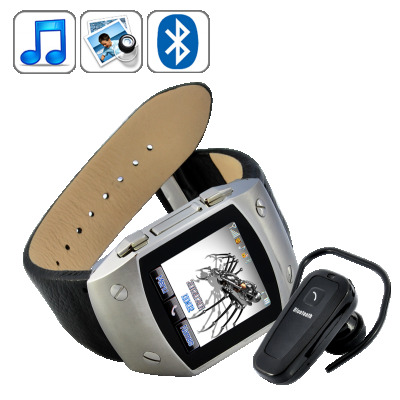 Successfully Added RUSH - Touchscreen Mobile Phone Watch with Bluetooth Earpiece (Worldwide Quadband GSM) to your Shopping Cart. When convenience, speed, and practicality are needed in today's busy world of mobile communications, nothing beats a cell phone watch. With the included Bluetooth earpiece and the ability to instantly make/pick up calls, the unique RUSH Mobile Phone Watch is a truly technological blessing. For those who have never seen a watch phone before, just imagine glueing a smartphone to your wrist. All you need to do insert a SIM card and you can start making phone calls and sending text messages on the high quality touchscreen LCD display. The RUSH Watch Phone also works on the worldwide Quadband GSM networks (850MHz, 900MHz, 1800MHz, 1900MHz) and comes unlocked, meaning you can take it all over the world and use it with SIM cards from almost every country. On the outside, the RUSH Watch Phone features a highly durable stainless steel face that lets you safely show it off. The 1.5 inch touchscreen in the center is just as durable but looks much more impressive and even allows you to playback video files, music, pictures, and text documents (like e-books). The RUSH Watch Phone is available in our warehouse right now and ready to make your life easier. Order yours today and we will express ship it out tomorrow - guaranteed! Brought to you by the online leader in Wholesale Electronics and Watch Phones - Chinavasion.